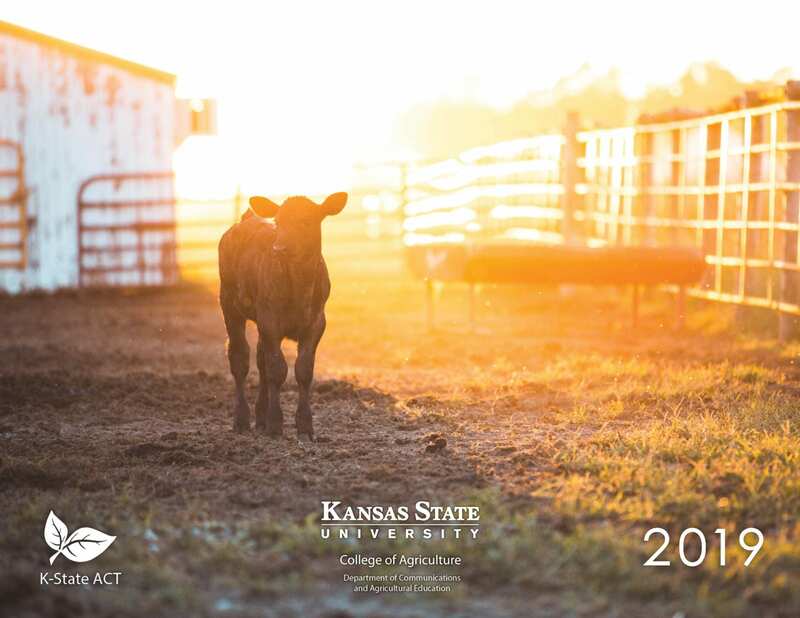 The Agricultural Communicators of Tomorrow (ACT) club has implemented a 2019 calendar sale into their fundraising efforts. Calendar proceeds will help support chapter professional development and travel opportunities. Calendar photos were taken by agricultural communications and journalism (ACJ) students during in AGCOM 420, Imagery in Agriculture class. Audrey King ’13, ’16 taught this class in the 2018 spring semester. Many ACT members were in the class and wanted to create a calendar to showcase student photography. Katelyn Harbert, agricultural communications and journalism student, headed the calendar creation process. 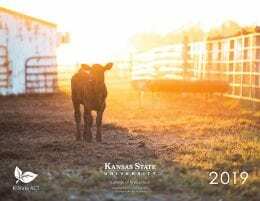 For those interested in purchasing a 2019 ACT calendar, the price is $15. Copies will be ready for distribution by December 12. Payments can be made in cash, check or by credit card in person in 301 Umberger Hall. Checks can be made out to Kansas State University ACT and mailed to 1612 Claflin Road, 301 Umberger Hall, Manhattan, Kansas 66506. For credit card payments, call (785) 532-5804. Use this link for online orders: https://goo.gl/forms/v3jIbQsvXE9MUW4U2. If there are any questions, email kstateact@gmail.com. The Agricultural Communicators of Tomorrow were busy during the month of March with social activities and philanthropic efforts. Officers hosted a “Paint Your Own Flower Pot” party for members to prepare for Spring. Students designed their own terracotta pots while enjoying snacks and sweets. All enjoyed a relaxing, fun evening while learning about upcoming events on the club’s schedule like K-State Open House, Ag Media Summit, NACTA Ag Media Team, and fundraising opportunities. “During this social, I loved seeing how creative members got when designing their flower pots, while also being productive and hearing about our events,” says Leah Giess, ACT Officer. In addition to social activities, members have also been busy working with the Flint Hills Breadbasket. Flint Hills Breadbasket’s mission is to minimize hunger and poverty through the distribution of available food and to nurture projects that will help alleviate hunger and poverty. As part of ACT’s philanthropic efforts, members design and prepare a newsletter for mailing. 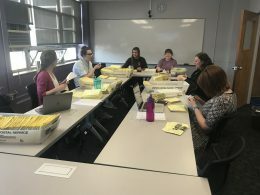 ACT member, Ashley Fitzsimmons designed the newsletter, and ACT members and officers prepared over 1,500 newsletters for distribution by tabbing and labeling. “Our club loves supporting such an amazing organization that does so much for our community, and we enjoy getting to use our skills and knowledge to help them with their duties,” says Giess. 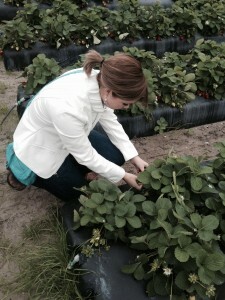 Nicole Lane, senior (ACJ), learns more about Florida’s strawberry industry. This past January, 14 agricultural communications and journalism students ditched their winter coats and headed to Orlando, Florida, for the annual Agricultural Communicators of Tomorrow (ACT) Professional Development Conference. The K-State group networked with students from across the nation, engaged with professionals through educational workshops and explored Florida agriculture.